Control your Expost private or business UK mailbox, secure mail forwarding and postal redirection. ProPost, our unique mail management system, gives you secure control over your mail and allows us to offer fixed handling costs forever. Once registered, you can log in to your control panel at any time to view and change your settings, or access real time information about your account. Add and edit your forwarding address, despatch options and contact details. Order a Demand forwarding or Scan & Send, add User names, change your Password, set SMS Alerts, turn Auto-renew on or off and top up your Postage Fund. All in complete privacy. See at a glance what mail has been delivered to your mailbox, the balance remaining in your postage fund and your account expiry date, view a Settings History report and a printable 90 Day Statement, itemising every log-in, handling charge, top-up and postage charge. Although this site is already fully responsive and useable on any smart phone, tablet or computer, we will shortly be releasing a free-to-download ProPost App for Windows, Android and iPhone, giving you instant, one-touch control of your post on the move! Use your secure controls to control how often we send your letters and parcels; Daily, Weekly, Monthly, or only on Demand. Change your forwarding address in an instant and tell us how you would like your mail delivered, by 1st Class post, Royal Mail signed-for, Special Delivery or by private courier! Please note: Our mail management system will produce your postage labels with EXACTLY the content and layout that you enter in the 'forwarding address' box, and please be sure to include a recipient name if this is required. 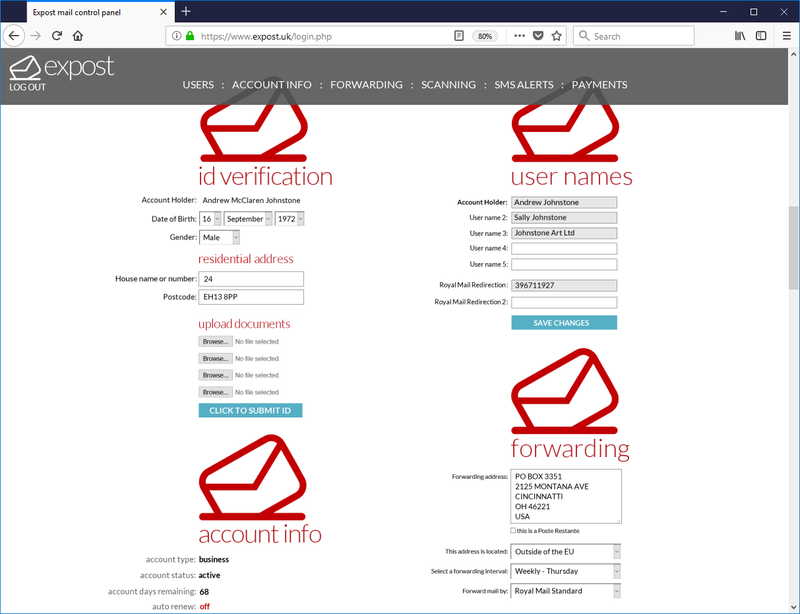 Every expost mailbox account is able to receive mail in up to five named addressees or 'Users', plus one or more Royal Mail Redirection accounts. You can add more user names at any time through your control panel and, because we have already verified your identity as the Account Holder, no further ID documentation is required. Our system will automatically keep you up to date on the state of your account through your control panel information and occasional emails, but you can also request alerts and notifications to be sent by SMS, directly to your mobile. All functions operate in real-time! This means that when an item of mail is delivered and logged into the system, it appears in your control panel instantly. Why does my forwarding address appear in capitals? Customers would often enter an address with incorrect capitalisation, which caused issues with some mail carriers' OCR (Optical Character Reading) software. Converting the whole address to UPPER CASE solves this problem and also makes the mailing labels easier for humans to read! What mail forwarding options do I have? You can elect to have your mail forwarded Daily, Weekly, Monthly, or stored securely until you request a despatch. You can then decide whether it is sent by 1st Class post, as signed-for, or private courier. All of the available options can be found in the mail forwarding page. How secure are my controls? They are as secure as you keep your password secret! Your personal data is held on secure cloud servers that meet all of the ISMS best practice guidelines, including encryption of your password. It is the proprietary software system that manages this site, your mailbox controls and postage fund, all accounting functions and the physical handling of your mail from receipt to forwarding despatch. Who owns the ProPost mailbox management system? All intellectual and physical rights to ProPost and associated mobile Applications, including the brand name and logotype are the property of our parent company, Expost Holdings Limited.